HAPPY VALENTINE’S DAY FROM MISS LILLIAN’S NO WAX CHOCK PAINT! Please enjoy this Gift from Us! From now until February 15th, 2018 – ALL Mini Metallic Samplers are 25% Off! Not valid with any other coupon. Online shop is limited to US Shipping Addresses Only. 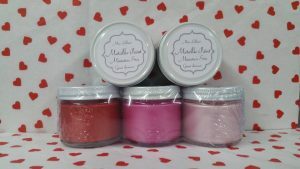 Previous post: Miss Lillian’s NO WAX Chock Paint Announces Spring Fling Collection with 6 NEW Colors!